We’re catching nice king mackerel while deep sea fishing Gulf Shores. Summertime is king mackerel time in Gulf Shores. King Mackerel is one of the most sought after fish along the Gulf Coast. Most kings we catch weigh in at over ten pounds, while some may come in at over 30 pounds. A great fighting fish and very tasty when eaten fresh, king mackerel can be quite fun to catch. As I am writing this it is July 2017 and Gulf Shores is nice and warm. So is the Gulf of Mexico, so we can expect the king mackerel to be in the area until October. Call me at 251-978-9711 to book a trip. Fishing almost everyday and being in contact with other professional fisherman, I have a good idea where the king mackerel are and what baits are working best to catch them. I will work to put you on fish quickly, so that you can enjoy catching king mackerels. There are many tournaments in the Gulf of Mexico where king mackerel is one of the most competitive classification. There are also major fishing tournaments that focus specifically on king mackerel. 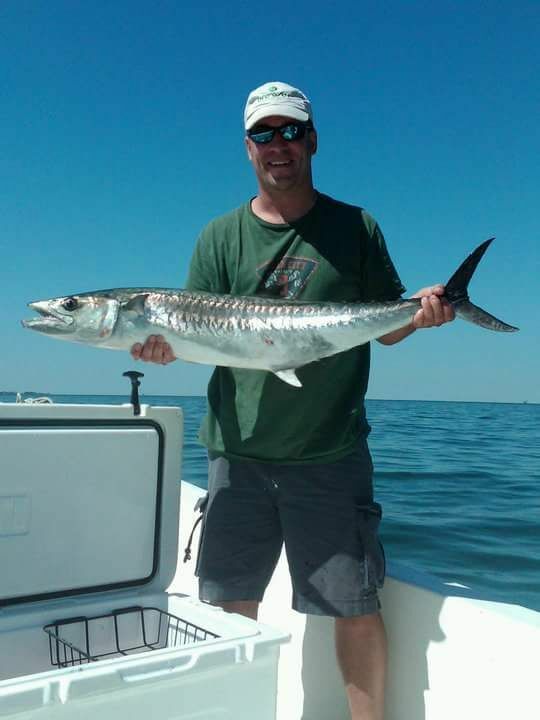 The current Alabama king mackerel record is held by Jeremy Alan Goldman of Dauphin Island, Alabama. Jeremy caught a massive 69 pound 15 ounce king mackerel on July of 2014. We fish the same area as Jeremy. Could you be the next record holder? King mackerel taste great when cooked fresh. Generally, they do not freeze well because of the healthy oils held in their flesh. Most often, locals will take steaks from the meat of the king mackerel. Grilled or fried, they are quite delicious. Many people like to smoke king mackerel and they certainly enjoy their catch that way. Another way is to filet the king mackerel. Fillets can be grilled, fried or even cured to make sushi or sushi-mi. Here’s a video showing how to filet a king mackerel.